This book presents a new approach to numerical analysis for modern computer scientists. Using examples from a broad base of computational tasks, including data processing, computational photography, and animation, the textbook introduces numerical modeling and algorithmic design from a practical standpoint and provides insight into the theoretical tools needed to support these skills. The book covers a wide range of topics - from numerical linear algebra to optimization and differential equations - focusing on real-world motivation and unifying themes. It incorporates cases from computer science research and practice, accompanied by highlights from in-depth literature on each subtopic. Comprehensive end-of-chapter exercises encourage critical thinking and build students' intuition while introducing extensions of the basic material. The text is designed for advanced undergraduate and beginning graduate students in computer science and related fields with experience in calculus and linear algebra. For students with a background in discrete mathematics, the book includes some reminders of relevant continuous mathematical background. 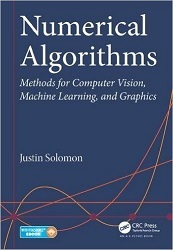 Justin Solomon is an NSF Mathematical Sciences Postdoctoral Fellow at Princeton's Program in Applied and Computational Mathematics, where he is studying problems in shape analysis, machine learning, and graphics from a geometric perspective. He received a PhD in computer science from Stanford University, where he was also a lecturer for courses in graphics, differential geometry, and numerical methods. Before his graduate studies, he was a member of Pixar's Tools Research group.